The year after the DePatie-Freleng Enterprises version of The Fantastic Four, the Thing got his own spin-off show, acting as back-up cartoon in an hour-long Flintstones show. Quite why anyone thought this would work is hard to fathom, as the Thing being placed into a world of Hanna Barbera anthropomorphic animals and haunted houses was unlikely to thrill superhero fans, and the show was just as unlikely to win over fans of Scooby Doo. In fact, in some of the weaker episodes it would be hard pushed to win over fans of Scrappy Doo. The entire concept hangs together like an series of Wacky Races guest-starring the Hulk, only not a tenth as engaging as such a concept sounds. And, despite the title of the programme, the Thing never actually appeared with The Flintstones. However, one frequently-repeated myth about the series is that it exists outside of continuity, as it features a young teen, "Benjy Grimm", who attends "Centerville High School" and becomes the Thing by touching two rings together. While that's the premise, it's actually not true that it doesn't fit in with Marvel continuity. A couple of the episodes, Gone Away Gulch and To Thing or Not To Thing actually reveal that the "Benjy" persona was a side effect of an experiment to try to turn him back into his human form. The scientist who caused the accident, Dr. Harkness, warns him that reattempting the procedure may even decrease his age so much that he ends up in diapers. Although the Fantastic Four are never mentioned, and the only punching Ben does is through walls, or one of the oddly ubiquitous octopi the show gives us, he does reference being Ben Grimm in reality. To Thing Or Not To Thing makes this explicit, with: "I've had it being 'Benjy' or boulders. I wanna be me again... test pilot Ben Grimm." Ben's friends in the episodes are Dr. Harkness's daughters, one of whom laments that she'll lose her friend if he's ever cured, and the other who he wants to date, which is slightly disturbing given that Ben is at least in his mid-30s and she's still attending high school. Completing the line-up is the rich, snobbish Ronald Radford (voiced by He-Man's John Erwin) who they all seem to tolerate at best, yet are friends with anyway. An occasional acquaintance is the school principal, Miss Twilly, who is the absent-minded, "daft old bat" character so typical of these kind of cartoons, and who generally irritates throughout her dozen appearances. 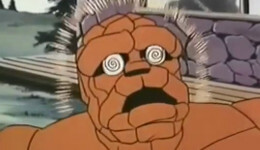 However, the worst supporting characters are the Yancy Street Gang, who always seem to turn up at the same places as the heroes, being generally annoying to the viewers, the makers almost contemptuous of the audience by introducing such lowest common denominator "comedy" into the show and expecting kids to lap it up. Stock "thug" characters, they drag down 14 of the episodes by appearing, one of them even sounding reminiscent of Bugs Bunny. Fine for Bugs, but for a human character? 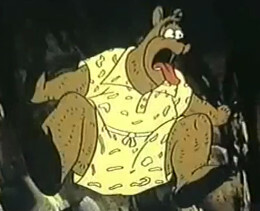 Animation on the series is poor, with Hanna Barbera's "limited animation" technique giving only partial movement to save costs, and, in some cases (most notably in parts of The Thing Goes Camping) having just completely still pictures while dialogue plays out over them. So, with all these pretty legitimate complaints, is the show as bad as they say? Well, no, maybe not. The series never made its way over to England, so on a personal note I don't have any childhood affection or memories of it, and, as the 6-10 year olds ARE its target demographic, maybe reviewers out there are a little too hard on the series. In fact, there's even the odd episode here and there that is almost watchable, with The Thing Blanks Out, Carnival Caper and To Thing or Not To Thing the best of a ropey bunch. Not only that, but Joe Baker as the voice of the Thing - a London-born voice actor doing his best Jimmy Durante impersonation - is pretty funny on occasion, though it can get wearying if you watch too many at once. Sources suggest that the episodes were, like most of Hanna Barbera's output, produced with a "laughter track". However, the series has been uploaded in full to YouTube and only four of them feature it. 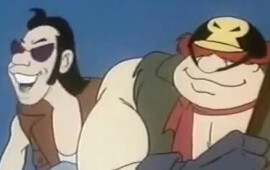 It's possible that alternate soundtracks were supplied for when the series was repeated on various cartoon channels in later years, but this is yet to be confirmed. So, a poor cartoon on many different levels, but perhaps better - just - than its lowly reputation. The instrumental theme tune may get stuck in your head for days, and the Thing, although having four fingers in the show, does get to bring us the catchphrases "idol o'millions", "what a revoltin' development!" 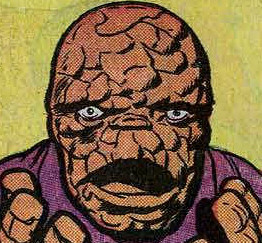 and, on occasion, "it's clobberin' time!" While it's often said the show was scrapped to make way for Fred and Barney Meet the Shmoo, that follow-up series contained the Thing segments as repeats, ensuring that Hanna Barbera got their money's worth out of the concept. The Picnic Panic, Bigfoot Meets The Thing, Junkyard Hijinks , Gone Away Gulch, Circus Stampede, The Thing and the Queen, Carnival Caper, The Thing Blanks Out, The Thing Meets the Clunk, Beach Party Crashers, Decepto the Great, The Thing's the Play, Double Trouble For The Thing, To Thing or Not To Thing, The Big Bike Race, The Thing and the Treasure Hunt, Out to Launch, The Day the Ring Didn't Do A Thing, A Hot Air Affair at the Fair, The Thing Goes to the Dogs, The Thing Goes Camping, Dude Ranch Rodeo, Photo Finish, Lights, Action, Thing!, The Thing and the Captain's Ghost and The Thing and the Absent-Minded Inventor. The show received a fun reference in FF #8 (2013), where the comic had Johnny Storm's sometime girlfriend Darla Deering don a Thing suit which was powered by two rings, and quoted the series' famous catchphrase "Thing ring, do your thing!"